Happy Friday! Please see below for next week’s MAP workshops. Happy Friday! Please see below for next week’s MAP workshops. Please keep in mind that campus is closed on Monday 4/15/19 for Patriot’s Day. Feel free to email mapcm@umb.edu with questions about the MAP program. 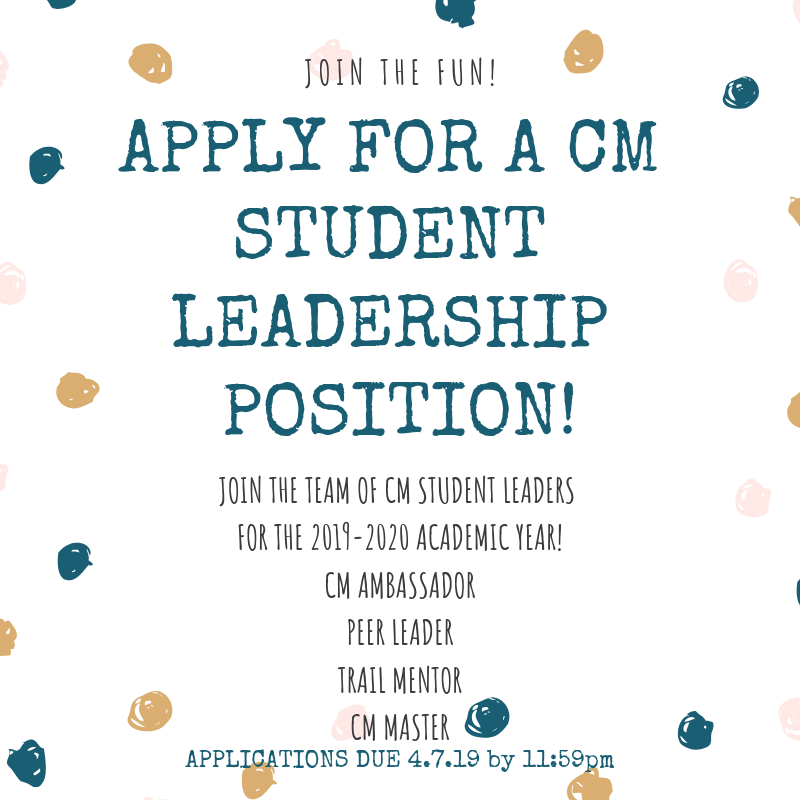 APPLY FOR A CM STUDENT LEADERSHIP POSITION! Follow the link below to view position descriptions and submit your application! Happy Friday! Please see below for next week’s MAP workshops and for the application link to student leadership roles in the College of Management Undergraduate Program office for the 2019/2020 year. Applications close 4/7/19 at 11:59pm. Apply for student leadership positions HERE. Check out this special opportunity to hear from Bill Cummings- see below. A Conversation with Bill Cummings, author of “Starting Small and Making it Big: An Entrepreneur’s Journey to Billion-Dollar Philanthropist”: Local author, entrepreneur, and billion-dollar philanthropist explains how he went from selling ice cream from the back of his bike and washing windows to building a 500-person firm near Boston with a debt-free portfolio of 11 million square feet of commercial real estate. Experience his achievements and adventures as well as his setbacks and personal tragedies during seven decades. For anyone studying business, building a business, or running a business, Bill’s journey also offers keen insights, cautionary observations, and the pioneering thinking that produced great prosperity and a multibillion-dollar enterprise. For everyone else, it offers a new and engrossing twist on the classic American success story. Event is open to the public. Registration is required. Visit alumni.umb.edu/cummings to RSVP by 3/22. The Greater Boston Chamber of Commerce is piloting Talentsetters where ten of its corporate members will use the Skillist platform (which is designed to focus on skills vs the traditional resume) to reduce hiring bias and offer more opportunities to students of color. The first round of internships are posted and more will be added over the next few weeks as participating companies start their hiring process for summer 2019. 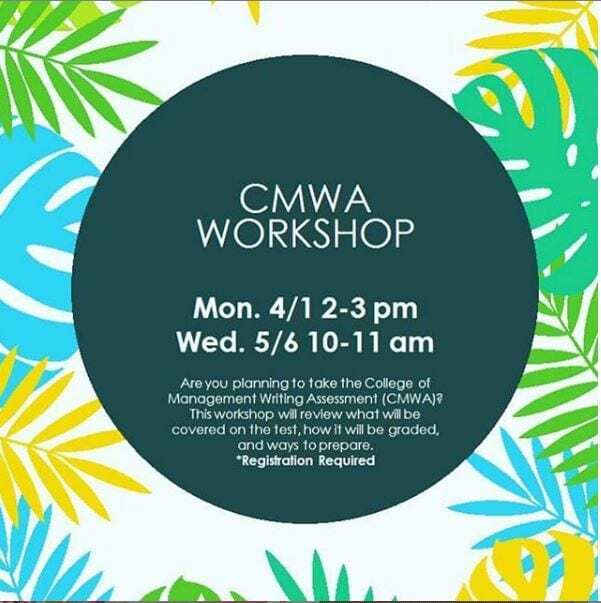 Are you planning to take the College of Management Writing Assessment (CMWA)? This workshop will review what is covered on the assessment, how it is graded and ways to prepare. 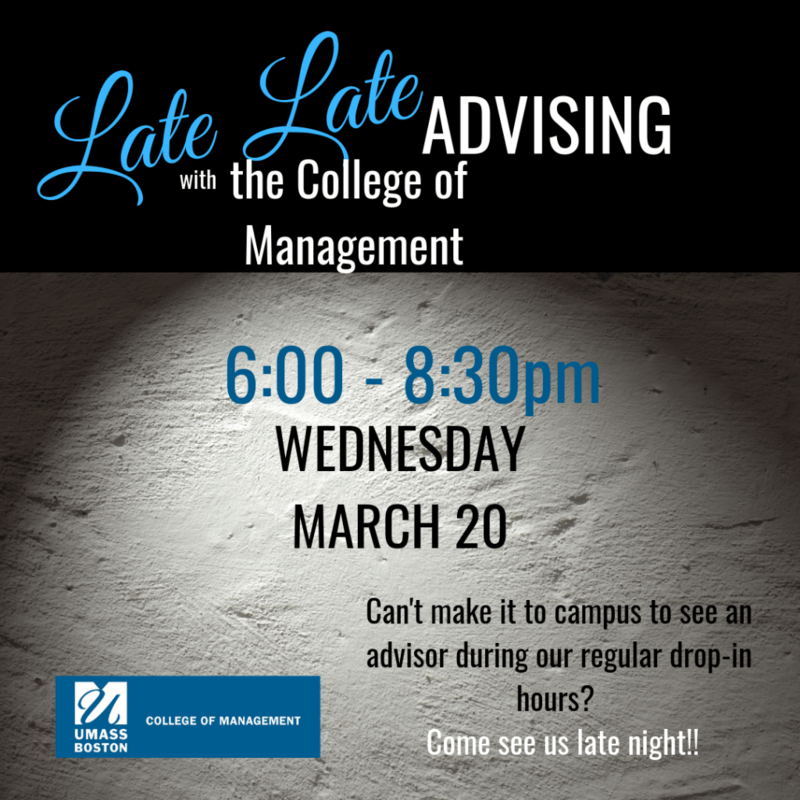 Late Night advising for CM students with 60+ credits!